Lawrence D. “Butch” Morris playing the cornet at Tin Pan Alley in NYC in 1987. Photo: Catherine Ceresole. LAST MONTH my friend Butch lost his battle with cancer. Lawrence “Butch” Morris was a visionary musical thinker and practitioner who invented a new way to create live music through a vocabulary of gestures and signs. Situated between live composition and free improvisation, he described his method as “an improvised duet for ensemble and conductor.” He named it “conduction” and even trademarked the term. For him, Conduction® was a way to be creative and spontaneous with large groups of musicians. Since 1985, Butch directed over 140 conductions, collaborating with over five-thousand musicians in twenty-three countries. In 1995 he released Testament: A Conduction Collection, a ten-CD box set documenting his work. The conductor, a figure of authority, seems out of place in the world of improvisation. But Butch managed to balance structure and spontaneity in the most natural way—he was a catalyst for improvisations. The purpose of his conducting was not to impose structure, but to listen and bring out what he heard and liked in a group of improvising musicians. It was a form of exchange and intimate dialogue. Musicians had to first learn his lexicon of gestures, and many resisted. Butch enjoyed pushing musicians outside of their comfort zone and disrupting their habits, but after twenty-five years he had fans and followers worldwide. The London Improvisers Orchestra is an example of his legacy in the UK. First assembled for the London Skyscraper tour in 1997, its members still play monthly. Butch in action was always mesmerizing: alert and sensitive to what was going on, shaping the music, not imposing anything but, through his ears, guiding the musician with sharp precision. I met Butch thirty years ago when we were both performing in John Zorn’s game piece Track and Field. Backstage after the performance Butch was warm and radiated positive energy; we became friends instantly. Over the years, we collaborated on many projects, and his friendship and support meant a lot to me. We regularly performed together when he was still playing the cornet, and I played in ten of his conductions. Butch was very personable and had many friends, yet he was discreet, even a little aloof. Sometimes he liked to disappear for a while, “gone fishing” as he said. His first album, from 1978, was called In Touch . . . But Out of Reach. There was something profoundly solitary about him, like a monk fervently seeking a grander vision. When Butch was not on the road, he could often be found at Casimir, a French bistro on Avenue B, just around the corner from where he lived on East Seventh Street. His neighbors were Elliott Sharp and Zorn, part of a talented community of artists who have nurtured me since the early 1980s. We all participated in each other’s projects and the sense of community was made palpable through the music. In October my wife and I were sitting with Butch on a bench in Tompkins Square Park, shortly after his release from the hospital. He told us he wouldn’t be around for very long. He knew he was dying yet he was surprisingly calm about it, still making plans. He was writing about Conduction® and worried about not having enough time to finish. I hope someone will publish his revolutionary ideas so they can reach a broader audience. The last time I saw Butch, in December, he was wearing a coat I gave him years ago. The long camelhair coat made me look like a banker, but on him it looked glamorous. He always dressed with flair and elegance. We kissed and hugged, and then he was gone. Christian Marclay is an artist based in London and New York. 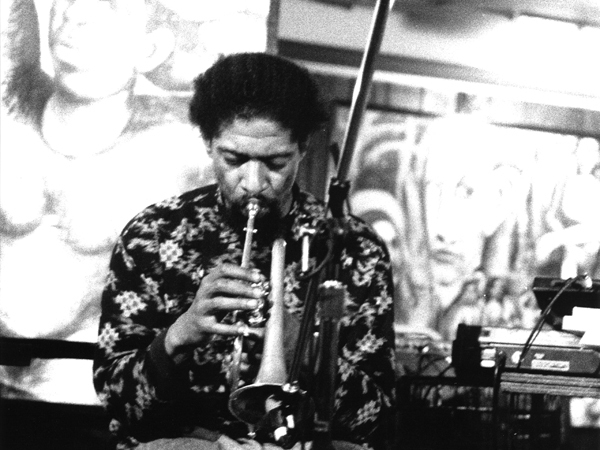 On the evening of Sunday, March 24, in New York, Nublu will feature an evening dedicated to the spirit of Butch Morris with a performance by Brandon Ross and a screening of Black February, a film by Vipal Monga documenting a series of concerts performed by Morris in February 2005.